I received a request to tie my Studio Manager product to iCal yesterday. This is not the first time I have received the request. I am just recovering from a brief illness today and with that excuse thought I would see how hard it would be to AppleScript between FileMaker and iCal. I have two books that should help me: AppleScript: The Missing Manual and AppleScript: The Definitive Guide. I looked at their tables of contents but didn’t see any reference to iCal. So, I then typed "AppleScript+FileMaker+iCal" into Google. I got plenty of hits to investigate. One of my first hits lead me to reading a comment about speed. And Bruce Robertson had a tip. He said if you run the following two line Applescript in FileMaker you can instantaneously duplicate a record and all of its children records. So I decided to try it myself. 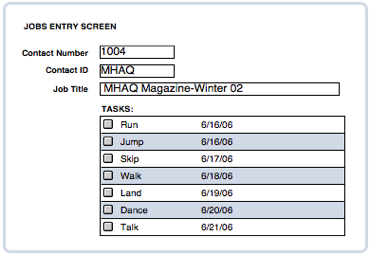 I created a FileMaker database called AppleScript_Playground and added three tables Contacts, Jobs and Tasks. These are tables in Studio Manager. I put in a few fields in each table. I figured eventually I would get to trying to import a set of tasks for a job into AppleScript. But for now I wanted to try the trick. So I created a layout in Jobs with a few fields and a portal to tasks. I entered some tasks. See illustration below. Bruce said you should not have any calculated fields on the layout if you want the trick to work. I have no idea why, but he was right. Until I removed the last calculation field from the layout, it wouldn’t work. You also need to have the ability to create the child records turned on and don’t have the auto-enter serial number on the screen. Anyway, if you have an auto-enter serial number for Jobs and that serial number is part of the key that links tasks to jobs, you are in business. There’s only one script step in the script: Perform Applescript. Bruce says it should be instantaneous with up to 50 related records. UPDATE: I just tried it with Job Specs, a second related table. The duplicate as is above duplicated the original record plus the related records in both portals on the screen instantly! Try this out as a 20 minute project if you aren’t already an AppleScripter who knows this stuff backwards and forwards. This entry was posted in FileMaker Tips on June 16, 2006 by janet.